The Eppendorf Mastercycler nexus is non gradient thermal cycler with an aluminum thermal block and 96x 0.2 mL PCR tubes or 77x 0.5 mL PCR tubes or 1x 96 well PCR plate capacity. Featuring a 4-99°C temperature control range, the Mastercyler nexus is a fast, safe thermal cycler. The Eppendorf Mastercycler nexus uses peltier elements and triple circuit technology to heat the lid to a range of 37-110°C. The lid also features Eppendorf’s flex lid technology for ergonomic lid opening. Block homogeneity ranges from 20-72°C < ±0.3°C, 95°C < ±0.4°C with an accuracy of ≤ ±0.2°C. 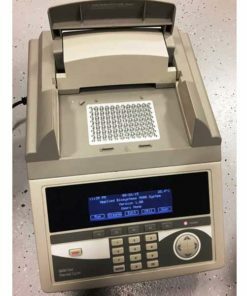 The Eppendorf Mastercyler nexus thermal cycler has an approximate heating rate of 3°C per second and a cooling rate of 2°C and features USB, Ethernet and CAN in/out interfaces. All Eppendorf nexus thermal cyclers feature low power consumption using only 700W during operation.